Named for their ability to darken and flair their jowls to emulate facial hair, the bearded dragon (Pogona vitticeps) is a reptilian lizard native to Australia. A prized export for the land down under, bearded dragons have become popular pets around the world. Because of the bearded dragon's calm and gentle nature, these lizards make good pets for first-time reptile keepers. For a bearded dragon, or beardy, the optimum enclosure is an aquarium-style tank. It can be as large as there is space for, but it must be at least 50 to 60 gallons, and rectangular in shape, to accommodate the dragon's eventual size of 16 to 20 inches. A tank made of smooth glass is used to avoid causing abrasions to the lizard's nose. The tank should be cleaned with warm soapy water and dried prior to use. The habitat for a beardy should have a tight-fitted, screened hood or lid. 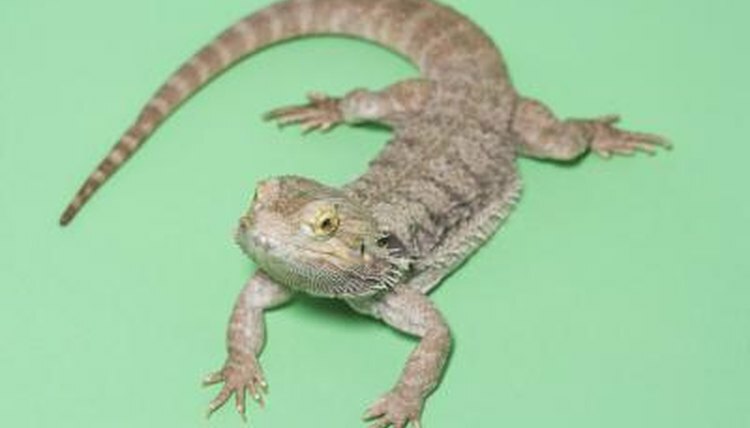 The bearded dragon is a reptile species that is acclimated to a hot, arid and desert-like terrain. According to beardeddragon.org, a fine, brown, dry, sandy substrate should be used to floor a beardy's habitat. Clean, dry and smooth, stones can be used for decoration and climbing purposes. Stones will also serve to hold heat during the cooler evening hours. When adding nonessential accoutrements to the home of a bearded dragon, remember the aim is for a naturalistic vivarium for reptiles. Replicating their natural existence is essential for proper nutrition and hydration for a beardy. This is done by offering a variety of their natural fare. A bearded dragon's diet should consist of live prey such as crickets, mealworms, wax-worms and an occasional pinky or fuzzy mouse. A beardy needs greens and vegetables twice a week. This fare should be shredded for optimum ingestion. For every other feeding session insects, greens and veggies should be dusted with a vitamin and mineral supplement mix. Clean, fresh water should be offered every day in the home of a beardy lizard. Ceramic bowls, roughly an inch deep, seem to work best. A bearded dragon will absorb water through its skin, as a way to hydrate, and misting machines are available. Temperature and lighting requirements are serious considerations when housing a bearded dragon. Thermoregulation is a term used to explain how reptiles need to alternate between hot and cooler climes to regulate their body temperature. According to Animal World, this can be achieved in the fabricated habitat by using a 100-watt T-Rex UVB-heat bulb that emits both UVB rays and heat, housed in a ceramic fixture. For the cool-off requirement, bearded dragon keepers often construct a shaded area in the tank or include a pre-built log or hollow-wood accessory. By How Much Is the Gerbil Smaller Than the Hamster?